Our goal is to work with occupiers to help reduce the environmental impact of their facilities through energy-efficient building design and operation and thereby to significantly reduce operating cost whether modular or a traditional build. Camro is located at a latitude of 52° 23’ 42” to the north of London and also north of Amsterdam in the Netherlands, Warsaw in Poland, Calgary in Canada and north of Newfoundland. With a temperate maritime climate, temperature and humidity are generally low and stable so ideally suited to ambient air cooling for data centres; Cambridge has one of the lowest rates of precipitation in the UK. 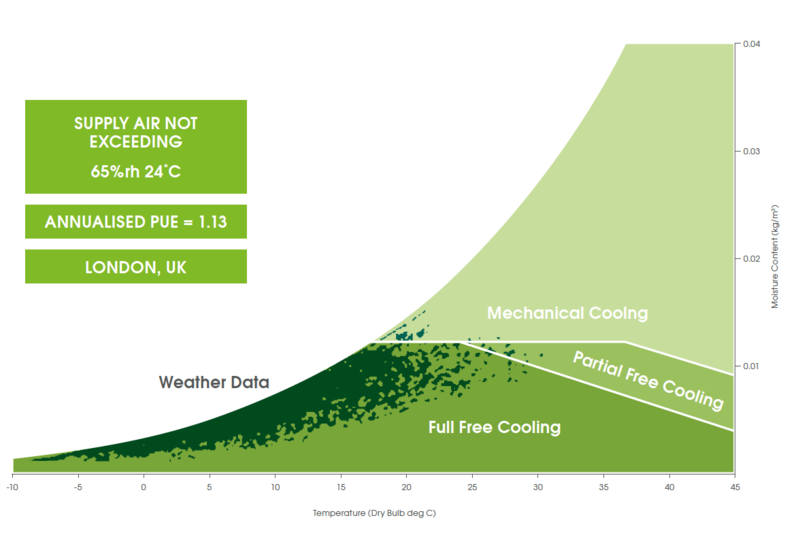 The chart opposite is based on ASHRAE/CIBSE data for London and shows ‘free cooling’ is achievable on average 99.71% of the year. Ambient air cooling offers highly efficient energy saving operation; in comparison to a 3MW IT load legacy data centre with a PUE of 2.0 a power cost saving over 10 years based on a PUE of 1.13 is calculated to exceed £12million.